Mad Racing has a take on bike stands that's completely different from the standard under-frame stand that you're used to using. There's no lifting. With the EZ Stand ($129.99), you just roll your front wheel into it, and the stand rotates forward to hold the front end, completely supporting the rest of the bike. You can even climb aboard to kick it over. Then just rock backward to roll out of it...simple. 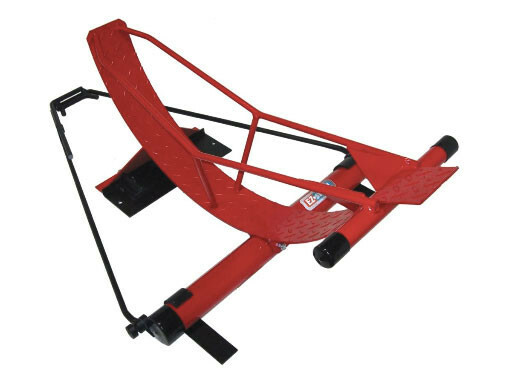 The EZ Stand can also be used in conjunction with their EZ Stand Wheel Chock and Clamp ($99.99), for fast and easy loading into a van or trailer. It also allows you to transport your bike without having to compress the suspension. Wheels Chocks are available in black only. Made in the USA, these puppies are rugged, and available in Black, Red or Silver Aluminum colors, with plans in the works for additional colors. They're also working on EZ Stands for smaller bikes. For maintenance like wheel and suspension removal? Yep, you'll still need a regular stand. But you can do plenty of regular mainenance (oil changes, etc.) using the EZ Stand, and for plenty of weekend riders this should be sufficient for a day at the races. 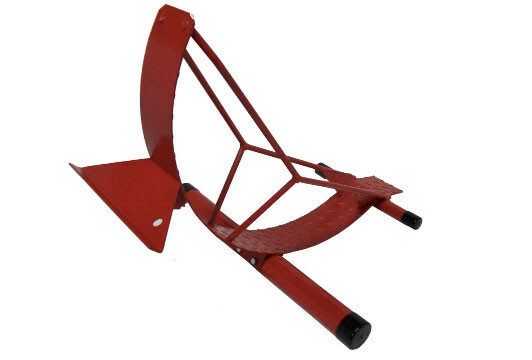 For videos of the EZ Stand and Wheel Chock and Clamp in use, or to order, check out www.ezstandmx.com. Related: Mad Racing Stands, Ramps, Etc. Mad Racing Stands, Ramps, Etc. Ya i seen them there cool with the chock clamp! did you see in the video it takes like 35 seconds to have a bike in the chock all clamp in no ties to deal with..
any one here have expirience using it for trailering? I have three of these stands and they work extremely well. It's nice to come off the track after a hard moto and just roll up on the stand and step off the bike. Really good product. I have one the advantages far out way the disadvantages. I only need to use my crate stand when i do tire work suspension etc.., other then i can do everything else in the stand its great when your doing engine work and most any work.. i just like parking the bike in it.. 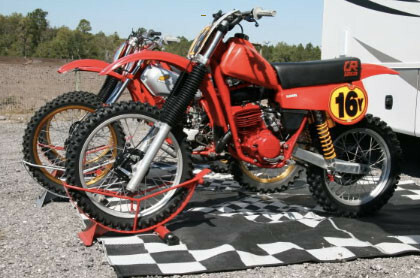 The bikes look much cooler looking in the easy stand..
Looks cool, but not very practicle for oiling a chain.